The plight of Turkmen community in Iraq saw a dramatic downward shift when ISIS militants attacked the town of Taza with chemical warheads in early March 2016. The attacks killed a young girl, severely injured 800 civilians and caused thousands to flee their hometown. The ugly return of chemical weapons to Iraq on the 28th anniversary of the Halabja chemical massacre was narrated by the words of residents of Taza, documenting the dire conditions of the Iraqi Turkmen in no-man’s land. An acrid smell still hangs in the air in parts of Taza, and its narrow streets are unusually quiet. On March 8, Islamic State militants fired more than 40 rockets carrying chemical warheads at this northern Iraqi town of mud-wall compounds and dusty date palms on, according to district head Hussein Adil, killing a young child and wounding over 800 civilians. After the attack, which may have been carried out with a mixture of chlorine and mustard gas, nearly half of the town's 30,000 residents, mostly ethnic Turkmen Shiites, fled in terror. Chemical warfare has made an ugly return to Iraq. The Islamic State group has carried out several similar attacks on Kurdish Peshmerga militia, according to the Organization for the Prohibition of Chemical Weapons, but the Saturday attack was significant for the large number of civilians targeted. It was also notable for occurring shortly before the 28th anniversary of the1988 Halabja chemical attacks – the worst chemical massacre of civilians in history. The rocket that killed Fatimah Samir never actually exploded. It landed in the pavement, gouging a small crater 10 meters (30 feet) from where the three-year-old was playing outside her house. A teacher walking nearby, Hassan Hussein, saw a white gas spewing from the rocket. Hussein said he was the first on the scene. 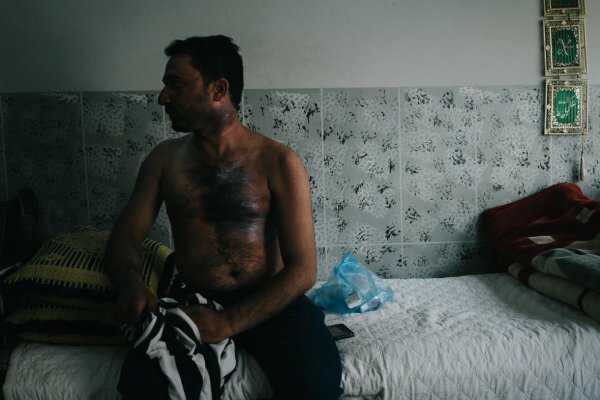 "There was a smell like bad gas or rotten eggs and the girl's skin was coated in an oily film," said the 29-year-old teacher from his home in Taza, where he was recovering from the effects of the gas. Hussein picked Fatimah up and rushed her to the nearby hospital. "I wanted to rescue her," he said. But her condition deteriorated, and she died in a hospital bed. Photos show her torso swaddled in bandages and her exposed skin blistered and discolored. Hussein later became sick himself and his throat and eyes burned. His skin blistered from where he had clutched the girl to his chest. These signs and symptoms were consistent with mustard gas poisoning, according to Nanem Saboh Mohamed, a doctor at Taza hospital where many of those affected by Saturday's attacks were treated. In Iraq, mustard gas is known as khardal and is nearly synonymous with another chemical attack. "People know about khardal from Halabja," said Mohamed. On March 16, 1988, 150 km [96 miles] to the east of Taza, the town of Halabja near the Iranian border came under a sustained chemical attack from Iraqi aircraft. More than 5,000 villagers were killed, in what would become the most infamous episode in dictator Saddam Hussein's genocidal campaign against the Kurds. Those responsible for the chemical attacks against Kurds in the 1980s may today be behind the attacks against Taza and the Peshmerga. "It's the same guys," said Najat Hussein Hassn, a member of the Kirkuk provincial council who hails from Taza. "Chemical weapons experts in Saddam Hussein's army are now in ISIS." Hassn's view is supported by a recent announcement that US special forces captured an important figure in ISIS's chemical warfare unit last month. Iraqi officials said Sleiman Daoud al-Afari was a chemical and biological weapons expert in Saddam Hussein's Military Industrialization Authority, and was detained in a raid on an ISIS-controlled village near Mosul in February. So far, though, experts say the chemical weapons employed by ISIS are not highly lethal. A forensic team that visited Taza after the attacks suggested the gas consisted of sulphur mustard and chlorine; the far deadlier attacks on Halabja used more lethal chemicals including the nerve agent sarin, in addition to mustard gas. The rockets in Saturday's attack were fired from Bashir, a Shiite Turkmen town 6 km (4 miles) to the west of Taza, which has been under ISIS control since June 2014. Bashir is well within mortar and rocket range of Taza, which Iraqi Security Forces drive through to reach a base in Makhmour. Local Shiite milita leaders blame a dearth of political will and a lack of coalition air support for the failure to retake Bashir. "We need the support of leaders in Baghdad and the Kurdistan Regional Government," said Zaki Kamal, the head of the Al Qaim Battalion, a Turkmen militia group based in Taza. "The villages we've retaken so far we did without support," he said over the roar of an outgoing shell fired from a militia position outside the town. Since the chemical attack, though, coalition airstrikes have struck ISIS positions near Bashir, suggesting an operation to retake the town could be forthcoming. From the Turkmen militia headquarters in Kirkuk, about 20 km (12 miles) north of Taza, commander Sayid Mohammed said they would retake the town soon, "God willing." The Islamic State's use of chemical weapons is a sign of desperation, according to him. "It's the end of ISIS, that they will use whatever they have," Mohammed said as his earpiece crackled to life and he excused himself to greet a convoy of militia leaders arriving from Baghdad. Meanwhile, Taza locals say they won't feel safe until Bashir is liberated. In a quiet residential street a few hundred meters away from where Fatimah was gassed, another rocket landed in front of a house during the same attack. The explosion blasted out the front windows and blew the leaves off a citrus tree in the courtyard. Plastic warning tape barred the gate on Tuesday, and a strong chemical odor lingered in the air. Iraqi Turkmen: A Semi-Autonomous Region to Protect Religious Minorities?